Wine prices rose for 19 consecutive months to June, at least taking the broadspectrum Liv-ex 1000 index as a measure (fig.1). The narrower Liv-ex 100 index rose for 17 consecutive months before a small blip in April, which it recovered over the following two months, ending the first half of the year up 3 percent. The two different measures—broad and narrow—have tracked one another remarkably closely over the past two years (fig.2). The Liv-ex 1000 gained 27 percent compared to 26 percent for the Liv-ex 100. This is in marked contrast with the two indices’ relative performance over the three years from June 2011 (fig.1). 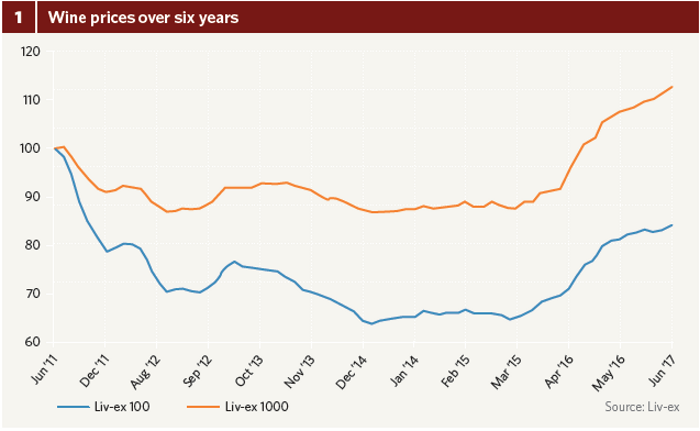 The Liv-ex 100, dominated by top Bordeaux, fell from the heady heights reached in the summer of 2011 and remained 16 percent below its peak at June 2016. 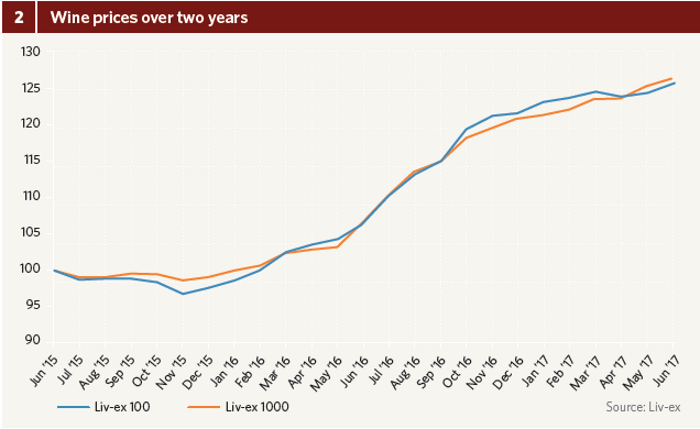 The more balanced Liv-ex 1000 index—representing a wider selection of fine wines—was able to resist such drastic losses and reached positive territory after five years, ending June 2017 up 13 percent. In issue 56, I suggested that the 2016 Bordeaux en primeur campaign might rekindle interest in the region. 2016 was one of the highest-quality vintages ever, from Left Bank to Right, and produced in large volumes to boot. In other words, everything seemed to point toward a healthy campaign, with no reason for châteaux not to offer large quantities of high-quality wine at reasonable prices. It was not, however, the unqualified validation of the en primeur system that it could have been. The idea of selling wine as futures before it is delivered to the customer a couple of years later might sound simple, but good luck to anyone from outside the Place de Bordeaux who wants to understand the politics and the psychology of this opaque system. One château’s misjudged release can put all of Bordeaux on edge, affecting the mood of the campaign until a more successful release wipes the slate clean and renews confidence in the trade. There were a few such instances of faux pas this year; choosing a release price, date, and even time of day is a delicate science that not all have mastered. On the other hand, several châteaux managed to hit the nail on the head. Lynch-Bages, for example, released at €96 ex-négoce when the Bordeaux trade expected it at more like €100–110; it immediately went up in price on the Place, in contrast with wines whose overzealous release prices were quickly eroded. The campaign kicked off encouragingly enough, with Cos d’Estournel and Montrose releasing early and maintaining their (already ambitious) 2015 prices. 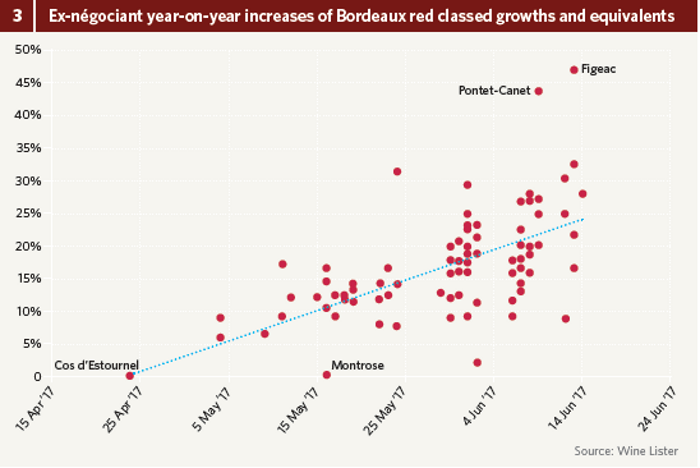 Prices crept up, however, as the campaign unfolded, and by the end, ex-négoce price increases topped 40 percent for Pontet-Canet and Figeac (fig.3). Across 150 of the top Bordeaux crus classés and equivalents, the average increase in the euro price quoted by négociants on 2015 was 14 percent. This was slightly more modest for first growths (11 percent). Nonetheless, this year’s en primeur campaign was certainly heading in the right direction. For starters, it lasted just eight weeks—from mid-April to mid-June—making it one of the more efficient of recent years. More important, the wine trade enjoyed significant revenue increases by comparison with the 2015 vintage, leaving the trade in Bordeaux and London nicely sated. Liv-ex reported that its UK-based wine-merchant members sold 40 percent more wine by value on average. Across the channel, major négociants I canvassed reported revenues up by between 5 percent and 25 percent from 2015, despite most selling similar volumes. CVBG’s managing director Mathieu Chadronnier puts the company’s 20 percent increase in value terms “only partially [down] to price increases” and equally to “evolution of the product mix,” through selling more higher-priced wines than last year, from communes such as St-Julien, Pauillac, and St- Estèphe. CVBG’s en primeur campaign was especially successful in the UK, where sales were up almost 45 percent despite the weak pound. Meanwhile, négociant Millésima reported revenues up by more than 20 percent, also boosted by sales to the UK, up more than 250 percent on 2015. In 2012 and 2013, disappointing en primeur campaigns left a sour taste in the air and prompted prices to recede. As the campaign drew to a close in June 2017, Liv-ex reported the highest levels of trading on its exchange so far for the year, suggesting that en primeur boosted the market. Furthermore, Bordeaux’s share of this trade rose to its highest point so far in 2017, at 72 percent in June. This figure nonetheless remains lower than the full-year average for 2016, of 74 percent (and indeed lower than the average in any of the past dozen years). For US-based auction house Acker Merrall & Condit, Burgundy overtook Bordeaux as the biggest revenue driver many years ago. Of its first-half turnover of $45 million, however, a resurgent Bordeaux (up 76 percent in value terms compared to the first half of 2016) almost got level with Burgundy again, at 32 percent market share compared to Burgundy’s 35 percent. For the complete version of Liquid Assets, please refer to Issue 57 of the print magazine.